In this example, we use sub-simulations and plot different parts of the data set against each other. To use subsimulations means that you run different simulations which differ in specific sets of parameters. There are often situations where this is a good approach. Sometimes just because it structures your process, sometimes for technical reasons. We use a good example for a technical reason here: Two simulations that use different implementations of the Prisoners Dilemma. Such a dilemma is described by four parameter settings and here, we do not want all of the possible combinations between the two dilemmas (4*4=16). We want only two combinations - the two dilemmas. # how cooperative are the non-learners? # what ratio of all agents is learning? We als have some more parameter settings than in the basic example. n is the number of agents, ratio_learning indicates how many agents will change their likelihood to cooperate based on their experiences and mean_coop is the mean likelihood to cooperate of the (non-learning) agents. Have a look in the executable for this simulation to see what the simulation is doing exactly. Basically, we are interested in the likelihood to cooperate which the learning agents will arrive at (they start at around 0.5). The second dilemma (in sim2.conf) is technically not a Prisoners Dilemma. I just played with the numbers to see how the very very simple learning algorithm I used behaves when in the dilemma temptation and reward (as well as penalty and suckers’ payoff) are the same. In this case, we need to provide the configuration files sim1.conf and sim2.conf. Note that we left out the .conf-extension when we mentioned them. In the subsimulations, we define a unique subset of settings in their own [params] - section. This is where we describe the different outcomes of interactions (payoff-wise) in our two versions of the Prisoner’s Dilemma. We can also give each simulation an own name and name a new maintainer for each subsimulation. To make it clear: It does not appear any different to your executable if a parameter setting is defined in one configuration file or the other. If you specified a comma-separated list of parameter values in stosim.conf or in a sub-simulation config file, your executable code will get one config file with all parameters available in the params section (the configuration file for each setting is also put into the subfolder in the data dir). You only need to know that settings in the sub-simulation config files (here: sim1.conf and sim2.conf) overwrite the general settings in the main configuration file (stosim.conf). [fjd-recruiter] Hired 1 workers in project "Sub-simulation_Example". [fjd-dispatcher] Started on project "Sub-simulation_Example"
[fjd-recruiter] Fired 1 workers in project "Sub-simulation_Example". The second fjd-dispatcher line changes as it goes on. In the beginning it had 240 jobs. If you use the pbs scheduler, your output looks different. With all the data we have, we also should make some figures to look at - we’ll use our parameter settings to plot different data sets, such that we can meaningfully compare the outcomes of different settings. 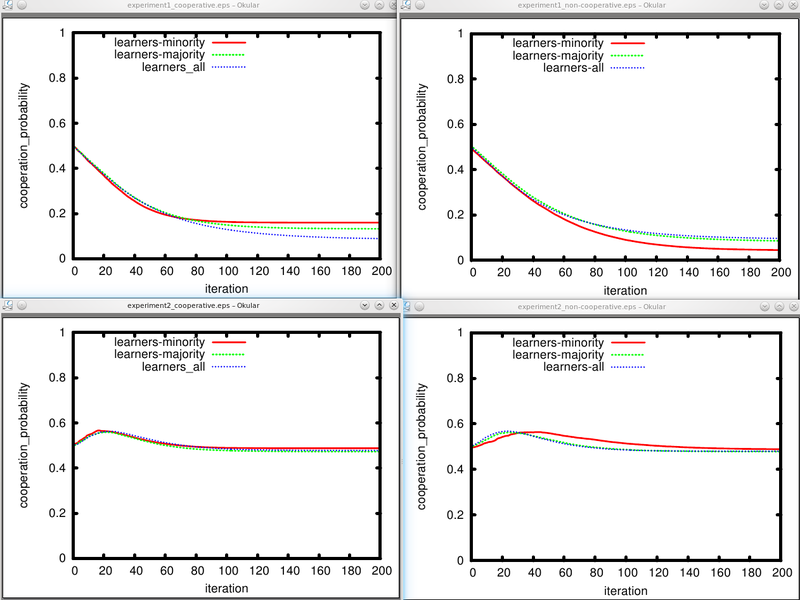 Figure 1 shows likelihood to cooperate of learners when the non-learners form a cooperative environment (mean_coop:0.8) and Figure 2 does this in a non-cooperative environment (mean_coop:0.2). Figure 3 shows payoffs of everyone in both environments. Figure descriptions can also be put in the subsimulation’s config files. This should help to keep bigger projects a bit structured (just start numbering at 1 in each file). © Copyright 2014, Nicolas Höning. Created using Sphinx 1.6.7.